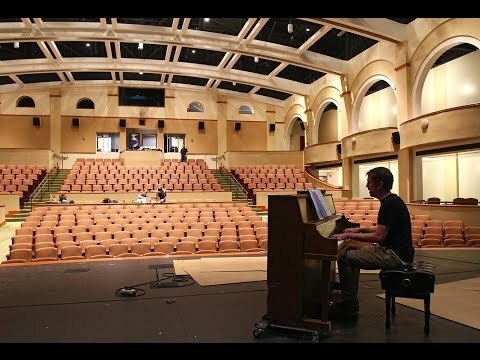 Todd Billingsley, a piano accompanist for Palo Alto High School, plays a few songs before students from the concert choir class enter the new Performing Arts Center on May 4, 2016. Photo by Veronica Weber. The four female Palo Alto High School students who make up the a capella pop ensemble the Heartbeats took the stage recently with just their voices and their microphones, and suddenly, the sound quality of a professional concert engulfed listeners. They sang to a tiered sea of 550 seats and box seats below elegant arches, a covered orchestra pit hidden below their feet. To their left, a black spiral staircase led to not one but three catwalks masked by a coffered ceiling. They and choir teacher Michael Najar might have been thinking to themselves: "Dorothy, we're not in Haymarket anymore." The Heartbeats were not singing in Paly's near-century-old Haymarket Theatre -- which is beloved for its history but bemoaned for its poor sound quality, small size and frequent visits from rats -- but rather in the school's brand new 25,000-square-foot performing-arts center. Some finishing touches still remain to be added on the building that's risen along Embarcadero Road, but Paly's choir, band, orchestra and theater students and teachers have been excitedly entering the theater over the last week or so to test out the sound system and to explore. They have oohed and ahhed over the high-tech space, where the acoustics are adjusted to the performers with the touch of a button on a laptop. Though the theater's official opening will be held in October, it "soft opened" Thursday night with an instrumental performance. The first-ever choir and theater shows will follow next week. Junior Edward Park, who is involved in band, choir and theater, said he almost cried walking onto the stage for the first time. Nadia Leinhos, also a junior in theater and choir, loves the space so much that after only one time inside, she made a photograph of it the background on her cell phone. After hearing the Paly Madrigals vocal group practice for the first time on stage last Wednesday, Najar told his class: "That sounded so legitimately beautiful I can't think straight." For these students and teachers, the new center, the product of a years-long $29 million effort, finally provides a physical space befitting of the school's robust performing-arts program. "I think that environment is important," said Paly theater director Kathleen Woods. "Having the opportunity to perform in such a professional level space, in such a beautiful space, will encourage students to really work hard and do their best. "I think it's already increased the positive visibility of performing arts on campus," she said. Najar, Woods and and Paly's instrumental music teacher, Jeff Willner, had pushed for upgrades to the Haymarket Theatre several times before 2008, when voters passed a $378 million Strong Schools Bond that provided the funding necessary to build a new theater. After 2008, the three teachers -- along with parents Holly Ward and Stuart Berman, architect Erwin Lee and other community members -- formed a theater steering committee and began in earnest on plans for a new facility. They visited other local performing-arts centers, worked with an architect and held community meetings to gather input. In 2012, the school board unanimously approved the project. Construction began in 2014. The Haymarket, which was built in 1917 and seats about 520, including the balcony, will remain, though it will be refurbished, according to Woods. Students describe it as "run down" and, simply, "old." Its small stage has been limiting, particularly for large groups like the choir. Poor acoustics swallow rather than amplify sounds. (Najar stopped letting the choir perform there.) The green room is also the theater's sole changing room, for both girls and boys, and a storage space. There is no orchestra pit, so when the orchestra performs, some members sit in the audience. Despite the challenges (including the rats, bats, squirrels and owls who make unannounced visits), students speak endearingly about the Haymarket. "Working in the Haymarket is life-changing because it's not a good facility, but that's what makes it so nice to work in -- the fact that it gives you so many problems that you need to work out and figure out," Park said. He and other students said they have had to jury-rig technical solutions many times given the space's constraints but appreciate the adaptability they've gained as a result. The "eccentricities" of the Haymarket have also brought students closer together and created a close-knit community, said senior Lana Graves, who is in both choir and theater and is studying musical theater at college next year. Leinhos, too, said the Haymarket feels like a home -- albeit one with a stage. She often spends her lunchtime in the green room hanging out. "It's a theater that everyone pretty much feels like they belong in," echoed Park, who plans to return to Paly after graduating to work as one of the theater's technical directors. "It makes it that much more personal to work in." This isn't to say they're not ready for a new, multi-million dollar state-of-the-art performance facility. But their time in the Haymarket will be more limited. Most performances will be held in the new center, but the Haymarket will be used for events, meetings and rehearsals, if necessary. From the outside, the new theater looks like a more modern, much larger version of the Haymarket. It has architectural elements similar to those that are repeated throughout the campus: Spanish styling with arches and red clay tiles on the roof. "It feels like Paly," student Graves remarked. The center was designed by San Francisco-based firm Deems Lewis McKinley Architecture. The building itself is tall enough in the rear to house the nearly 70-foot-tall stage area, but it is gabled at lower heights toward the front of the building so as to not block the view of Haymarket and the school's iconic Tower Building. It is also tucked back -- a change from an early plan that placed the building in front of Haymarket. With completion of the theater, a redesigned parking lot opened last week, returning many parking spaces the school lost during the construction. Inside, the bells and whistles are endless: a mechanical orchestra pit that can be raised or lowered to accommodate different kinds of performances or to provide additional seating; the high-tech, customizable Meyer sound system that ensures high-quality audio for all kinds of performances, from jazz band to a cappella groups to a theater show; a full fly system that allows stage crews to drop and lift curtains, lights, scenery and people or do other stage effects; a carpeted lobby with flat-screen TVs on the walls and floor-to-ceiling windows that look out onto the Embarcadero side of the campus. "I think having a performing-arts facility that matches the talent and capabilities of the students and allows them to work in a facility that has industry standard technology -- those were some things that were important to me," Woods said. The center also features classroom space, changing rooms, green rooms, a staging area and ample storage. The classroom space is important, Woods said, so that the theater program has a permanent, dedicated space. Some seats are also modular, to accommodate more intimate performances -- an element that a theater planning committee pushed for in the design process. "I think it's going to feel less uncomfortable if we don't have a full house," Graves said. "It's really going to change the audience-actor interaction." Still other elements, from furniture and a grand piano to music stands for the band and risers for the choir, will be purchased by the Paly Performing Arts Boosters, a nonprofit fundraising group started by former Paly parent and Theatre Boosters president Ward last fall to buy items the bond would not cover. They have raised $75,000 so far, none of which has been spent yet, and aim to reach a three-year goal of $400,000. The group plans to install name plates on the theater's seats for donors who give a certain amount, which can be done through palypab.com. The theater will officially open this fall, the weekend of Oct. 1. The space will also be used by the entire school for events, assemblies, large meetings and the like. After the first school year, the administration will assess how much time the space could be made available to the wider community. Students and teachers alike say they have high hopes that the center will bring new levels of prestige and popularity to Paly's already acclaimed performing-arts program. More than 400 students participate each year in the program, which includes classes in theater, stage technology and design, choir, concert band, symphonic band, string orchestra, jazz ensemble, vocal music and Advanced Placement music theory. Though the building hasn't even officially opened, students say they already sense that their peers seem more interested in getting involved in arts productions -- such as choir students who plan to try out for next year's musical. Following the millions of dollars spent on a new athletic center, Media Arts Center, a classroom building and improvements elsewhere on campus, students are also thrilled to see arts education get equal support. Leinhos, who traveled last month to Sacramento to testify in front of the state Senate in favor of an arts-education bill, said it's meaningful to see her school support the arts. She recalled her transition to Paly from eighth grade, when she had just moved into the district from a small private school and felt daunted by the size of her new high school. What reassured her, she said, was the fact there was a new theater on the way in the next few years. "It kind of helped me ease into high school as well, knowing there was going to be a place for me and there was a place that I could grow," she said. "It's still helping. I guess bottom line is: I cannot wait to perform in that theater." VIDEO: Click here to watch an online multimedia piece showing more of the new Paly performing-arts center. Editor's note: This story was updated to correct information about the architecture firm that designed the performing-arts center. San Francisco-based Deems Lewis McKinley Architecture designed the center. Thank you so much to PAUSD for making this space available especially for our seniors who have endured so much disruption because of all the construction. It is super to celebrate final performances and awards in this beautiful space. The architecture fits beautifully with the front of the school and feels like it belongs and has been there all the time.